Last week, I wrote about how some kids today are very brand and IT savvy, but are totally alienated from nature around us. To the extent that while they can identify 50 brands they cannot identify if a common plant in the garden is harmful or useful. This situation has led to many accidents when kids have swallowed or brushed with some such plants. The important thing to remember is that the benefits derived from plants are far more than the small negatives that we have and as parents it is our responsibility to make sure that our kids know which plants can be dangerous. It is like the electric socket in our home, we know it is dangerous but we do not remove it, instead we teach our kids to learn to not touch the same. Listing all dangerous plants is beyond the scope of this post, what I am doing here is giving pictures and brief description of 6 plants that you are likely to find in your surroundings and the commonly visible parts of these plant like leaves, stem, and flower which can be toxic. I am excluding plants that though are known to be poisonous but are out of kid’s reach e.g. tuber is not likely to come in touch with a kid. 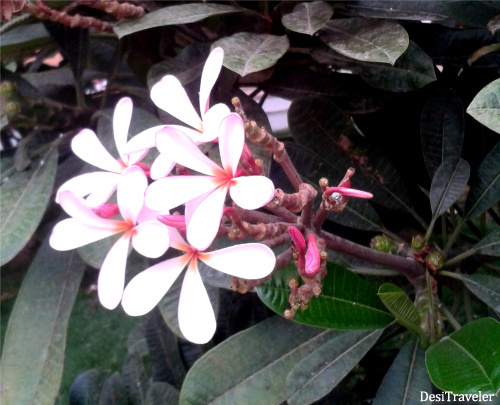 Plumeria or Frangipani : Is a common garden tree throughout India and the flower can be yellow, pink, white, red and mildly scented. The sap is mildly toxic and due to the nice smell of flowers kids love to collect them and at times will put in mouth leading to irritation. The sap from the stem is also toxic and can cause irritation and burning sensation if it goes into eyes. 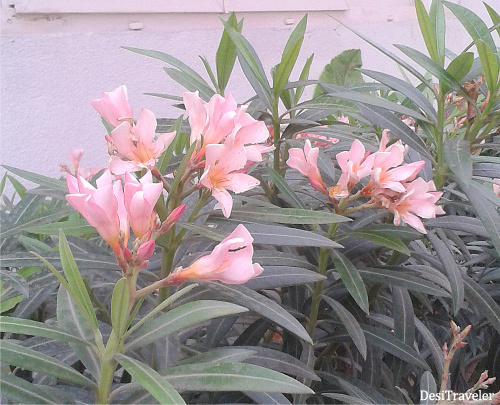 Nerium : Related to Plumeria, again the whole plant is toxic and is normally used as a hedge on road dividers, but nowadays some dwarf species with beautiful flowers are used for decorative purpose in housing societies. Again the sap is poisonous and will cause itching, burning sensation, and redness on the body part that comes in contact with the sap. 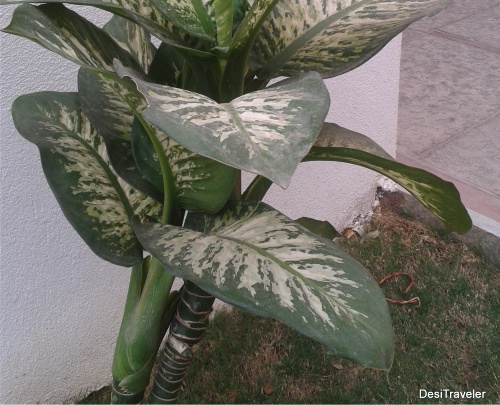 Dieffenbachia : Also known as dumb cane is very common throughout India and the whole plant is toxic, it comes in many forms with different coloration of leaves. The toxic effects are similar to the Plumeria and Nerium plants. The next three plants are less likely to be found in well maintained gardens but more in ill maintained public gardens, barren land, road side and also in forests and hills so one needs to be careful during outings. 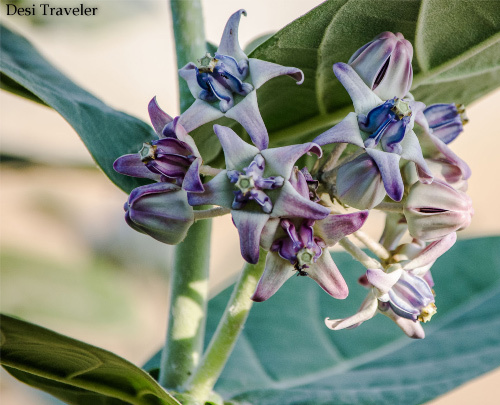 Calotropis : Commonly called as Aak and found almost all over India. All part of the plant are toxic, especially the milky sap that comes out from the plant. It can cause major burning sensation and itching and reddening of the eyes. The flowers are very beautiful lilac in color, thus attracts kids. 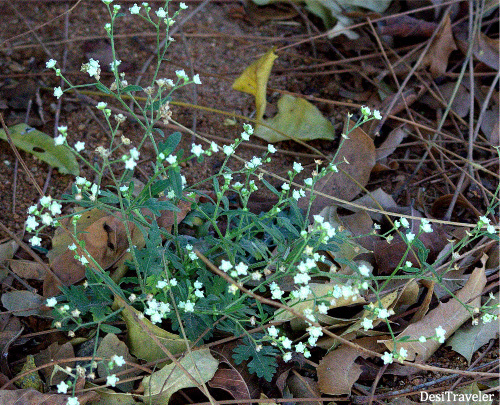 Parthenium : Is an invasive weed that keeps on showing even in well maintained gardens. This is one plant I suggest you remove from the root, because even if you do not touch it the pollens from the white flowers are known to cause allergy and aggravate asthma. The touch will lead to irritation and even dermatitis because of toxins present in the sap. 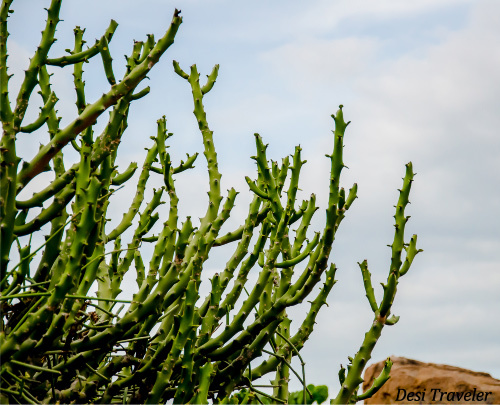 Euphorbia : Often confused as a cacti the Euphorbia is actually a succulent of the old world, the genus has 2000+ species and all produce a milky sap that is toxic to touch. They make beautiful house plants and some of them are not like the picture depicted here, and produce very showy flowers like the Poinsettias. Technically almost all plants can be toxic including the common apple (the seeds are mildly toxic). At times the difference between poison and medicine is the dosage taken, same holds true for most of the toxic plants around us, they all have a role to play in nature and their toxicity is there defense mechanism to protect them from animals and insects that eat them. The important thing is to know what grows around us and to ensure that the kids are careful around the ones that can cause harm. As parents we need to take a lead in ensuring that we not only take pride in the number of cars our kids can identify but also what is harmful to them around us.